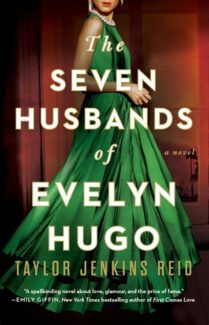 Naturally, The Seven Husbands of Evelyn Hugo will lead many readers to draw comparisons between Taylor Jenkins Reid’s fictional Hollywood star and the real-life, muchly married Elizabeth Taylor. Spoiler alert: Evelyn Hugo comes out on top every time. The two women, more alike than Monique realizes, hole up in Evelyn’s study, where Evelyn begins the eviscerating process of exposing her deeply personal history. “We’re really doing this. Evelyn and me. Subject and biographer. It begins now,” Monique tells herself, with no small amount of reverence. She already knows that Evelyn has an Academy Award, seven former husbands and a late daughter to her name, but what she doesn’t know turns out to be staggering. Evelyn starts her spellbinding narrative with her childhood in Hell’s Kitchen. Born Evelyn Herrera to Cuban immigrants in 1938, she is 11 when her mother dies of pneumonia. After her father becomes increasingly abusive, she hatches a plan—via unsuspecting husband #1—to escape to Hollywood. Once in Los Angeles, she dyes her hair blond, rechristens herself Evelyn Hugo, and lo, her wily ascent to stardom is underway. It goes without saying that #1 is tossed aside like the stub of an old movie ticket. While not terribly literary or highbrow, The Seven Husbands of Evelyn Hugo is seductive, transporting readers between sun-drenched Hollywood and high-rent Manhattan. Jenkins Reid creates a fleshed-out world with boozy parties and dazzling celebrities, but this sense of glamour is never at the expense of more meaningful subject matter. Indeed, Jenkins Reid offers a provocative examination of lust, ruthlessness and hunger, presenting a woman who is as vulnerable as she is scrappy. “My heart was never in the craft of acting, only in the proving. Proving my power, proving my worth, proving my talent,” Evelyn says. Jenkins Reid leaves it up to the reader to decide if it’s worth it in the end.